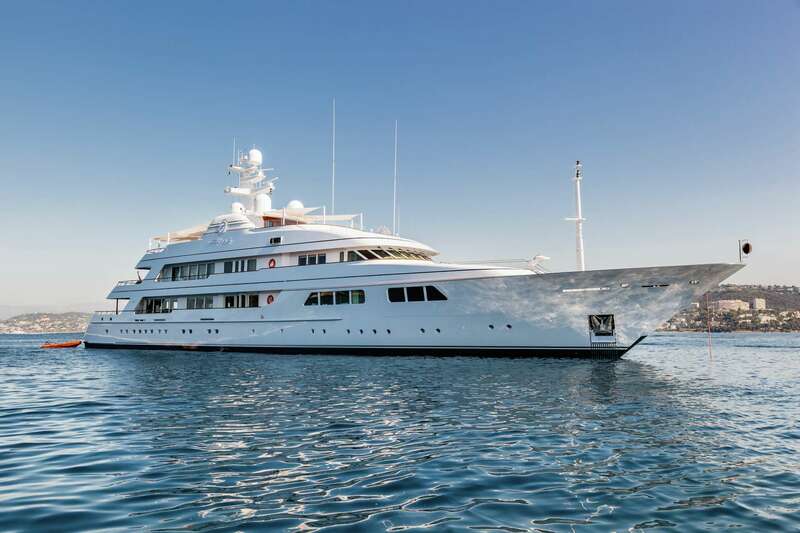 Sleek and stylish, the 62m/205ft FULLY CUSTOM SUPERYACHT motor yacht was built by the Dutch shipyard Feadship in 2001 and last refitted in 2012. 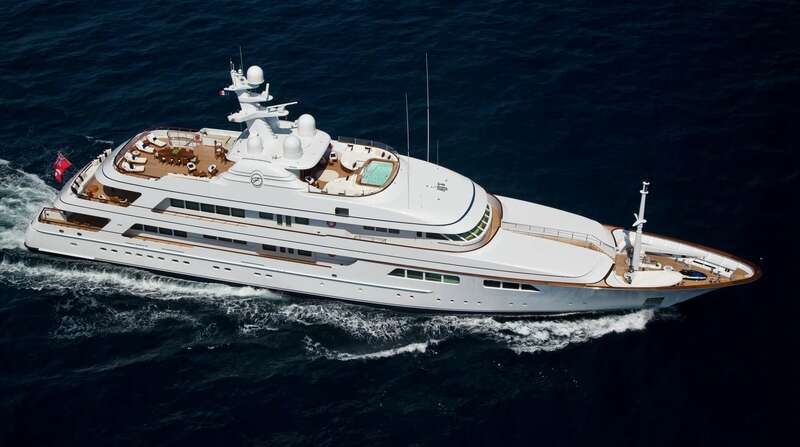 De Voogt completed her naval architecture and Dalton Designs and Andrew Winch completed her interiors. 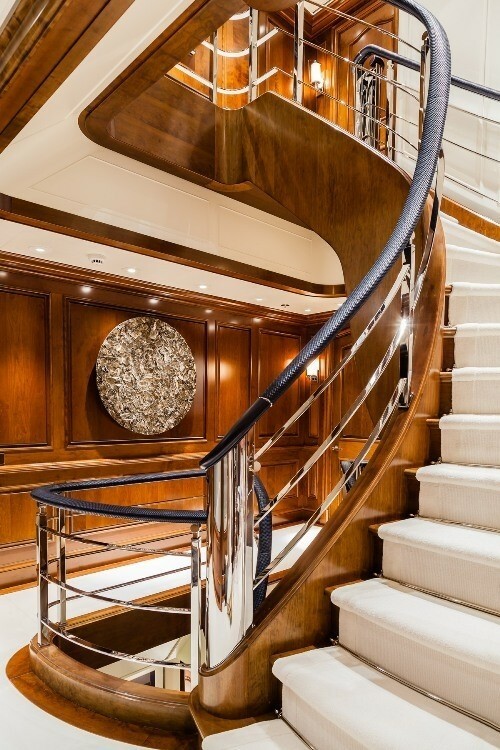 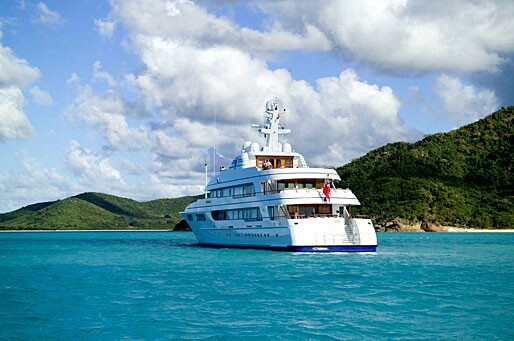 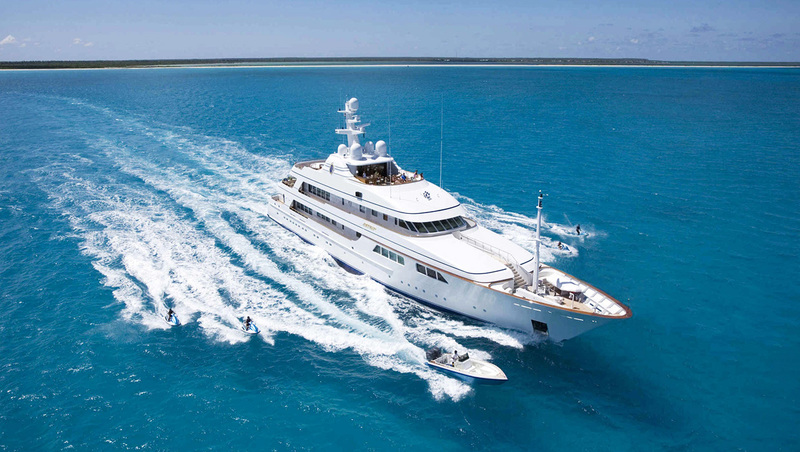 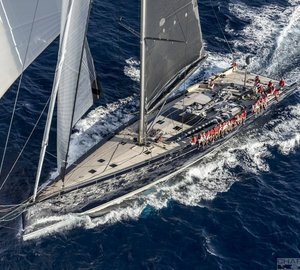 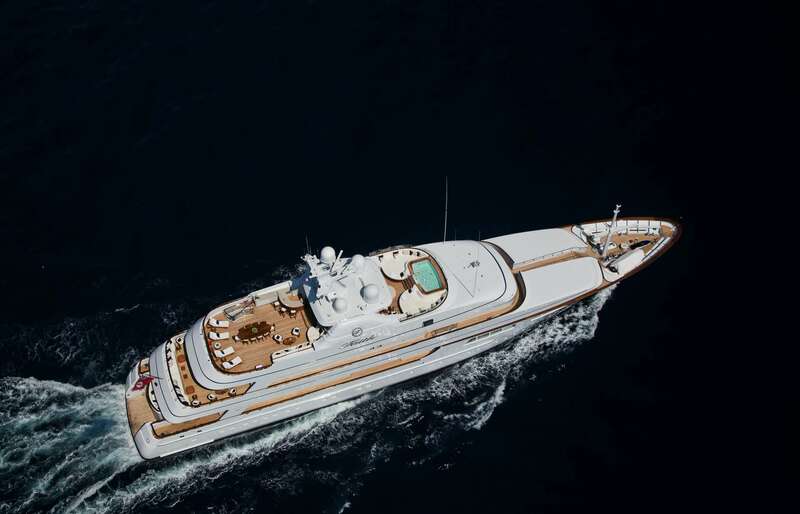 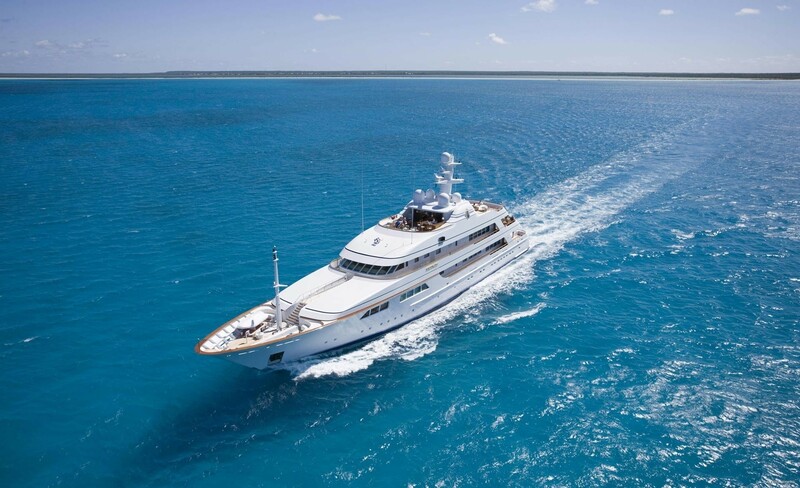 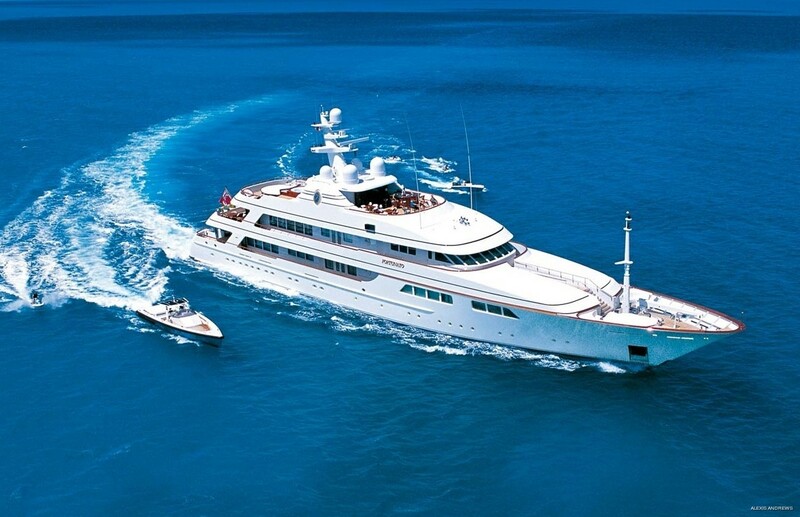 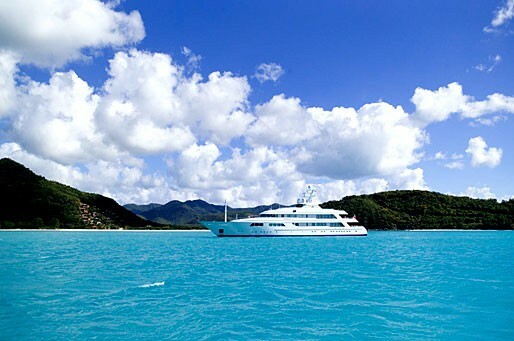 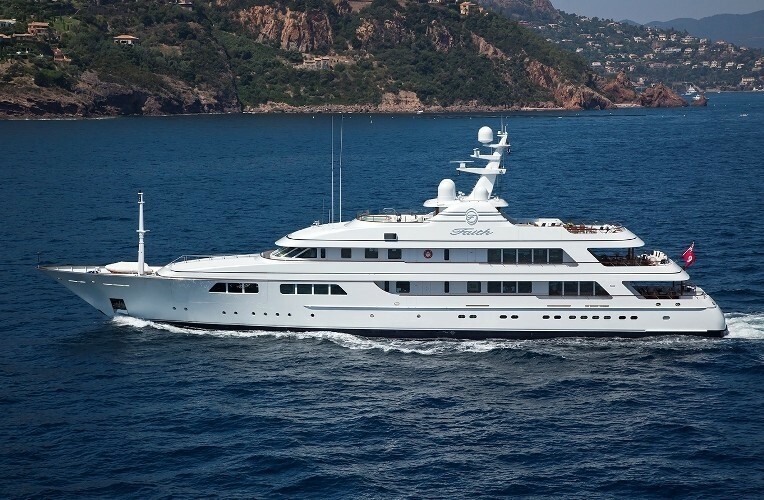 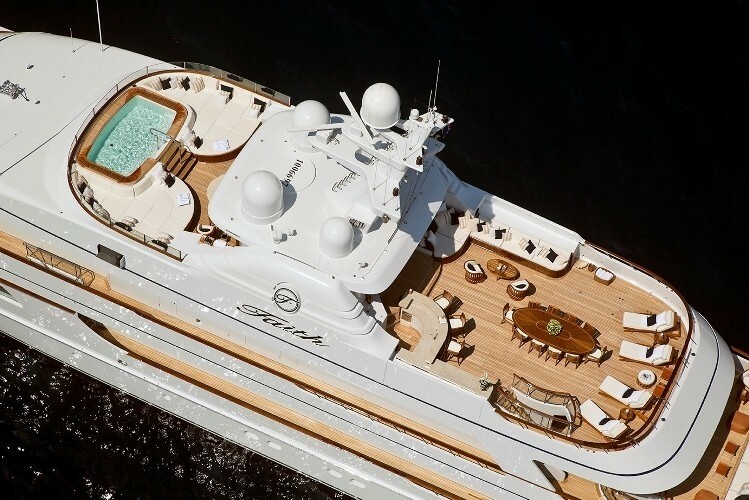 At the International Superyacht Society Awards 2001 and the World Superyacht Awards 2013, she took Best Power 43m+ and Best Refitted Yacht awards respectively, and up to 12 charter guests are accommodated over seven beautiful cabins. 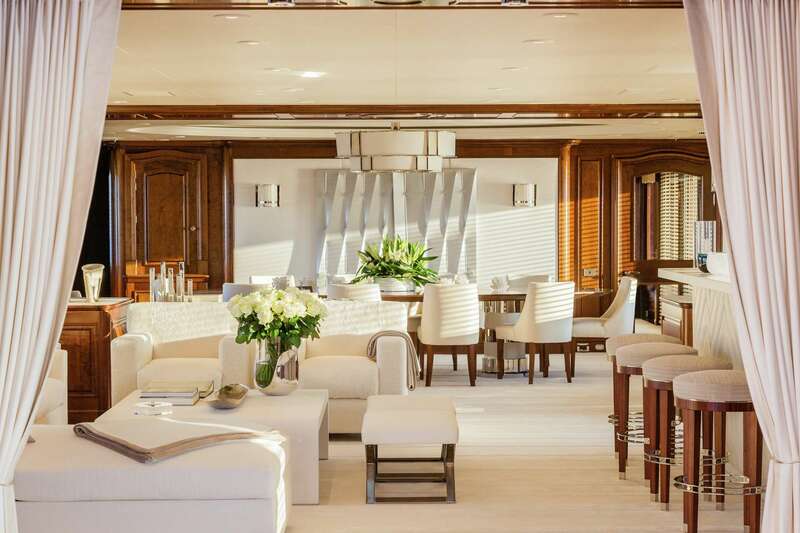 The lower deck of this magnificent 62m custom charter yacht by Feadship is fitted with a large swim platform for easy access in and out of the tenders and the motorised water toys. 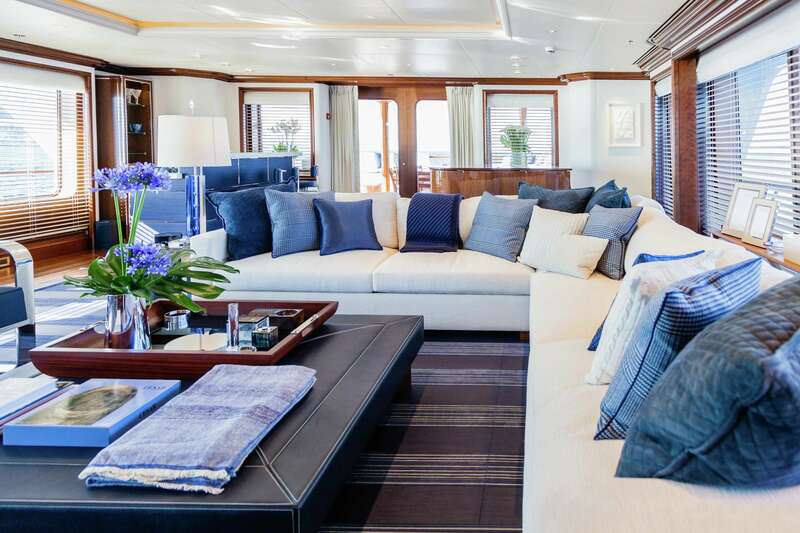 Above, guests are greeted by a plush shaded lounge on the main deck aft with plenty of room for drinks with visitors as well as guests. 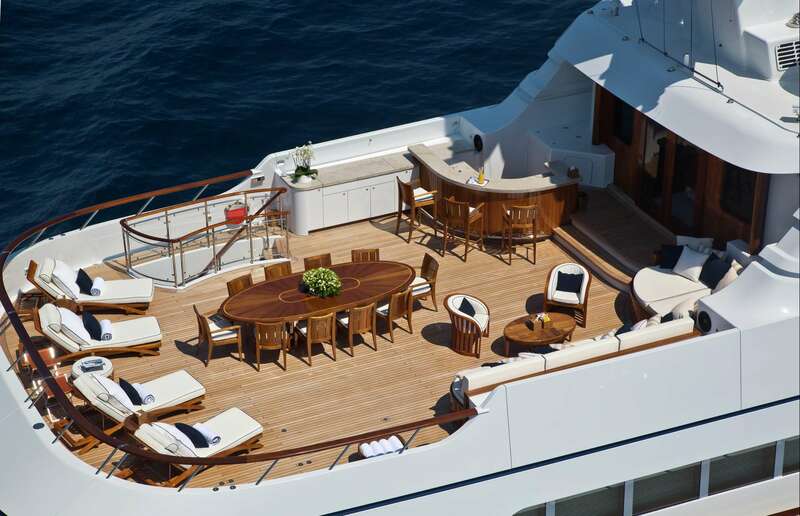 Dine alfresco out of the sun on the upper deck and watch the sunset from the stately oval table that seats up to 12 guests. 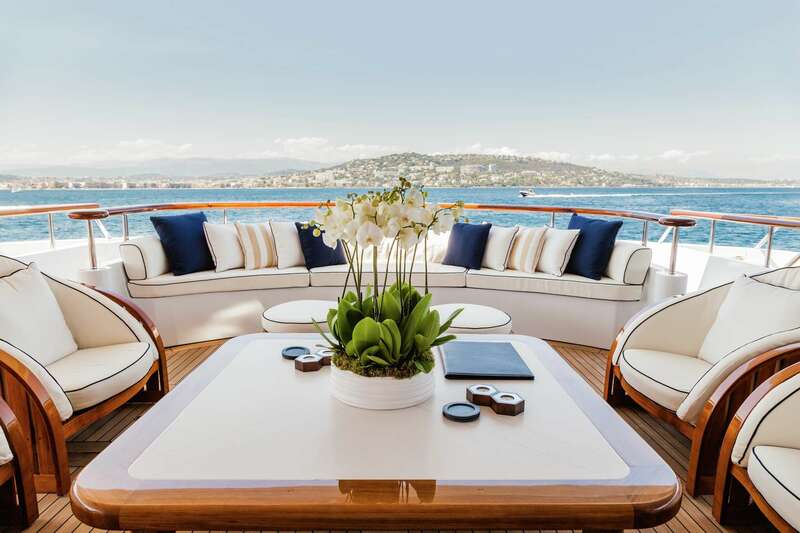 After dinner, remain outside for close conversation in the starboard seating or absorb the moonlit views from the stern. 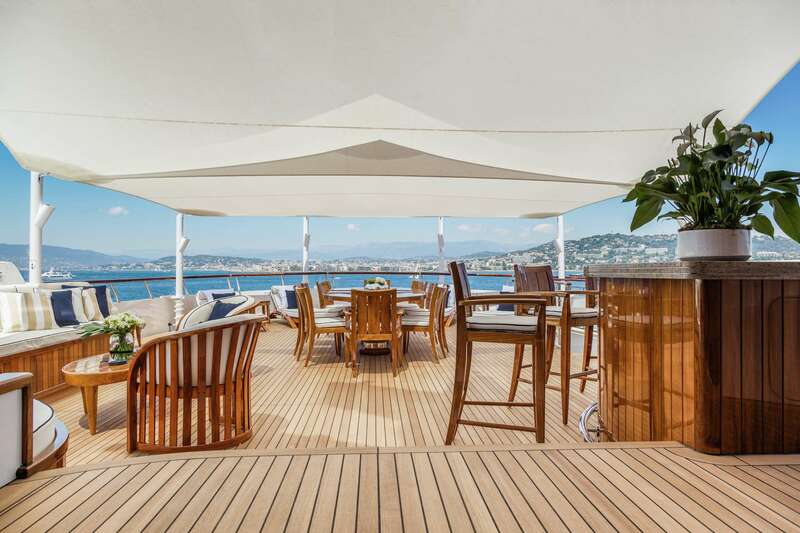 The sundeck aft mimics the upper deck dining arrangement and adds a wet bar, sun loungers and a sun pad for post-meal relaxation. 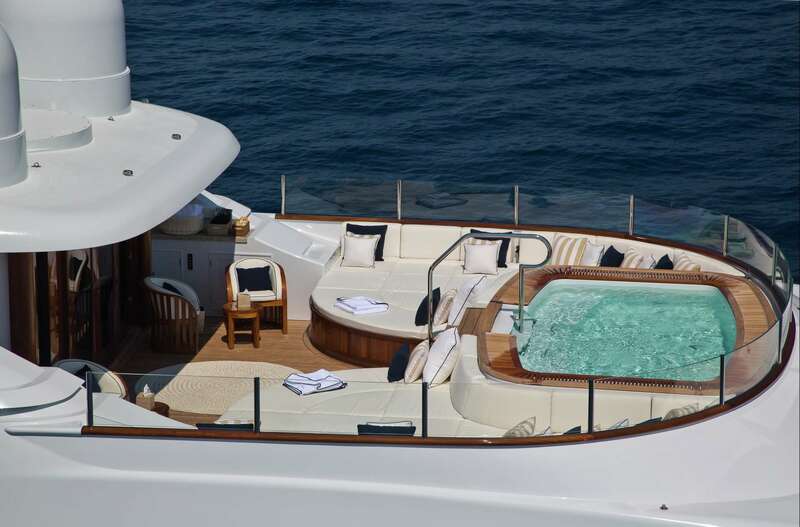 Sink into the Jacuzzi on the sundeck forward and take in uninterrupted views of the scenery before drying off on the surrounding sun pads with a nap. 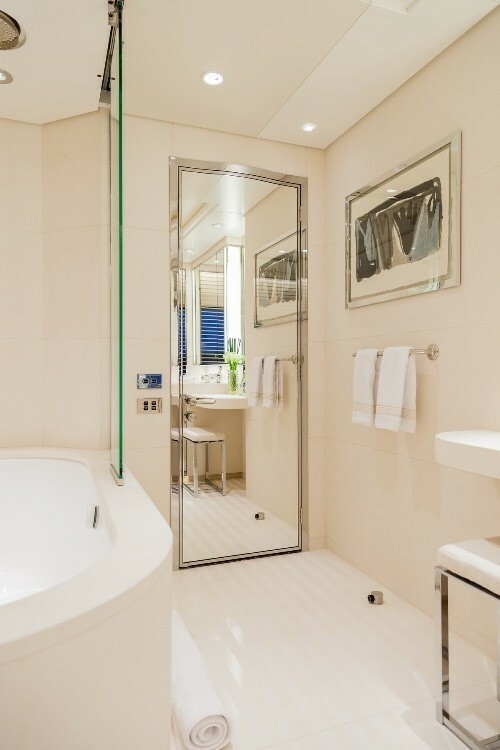 The pristine white interiors combine classic styling with contemporary design and Art Deco accents to create lavish accommodation and shared guest areas. 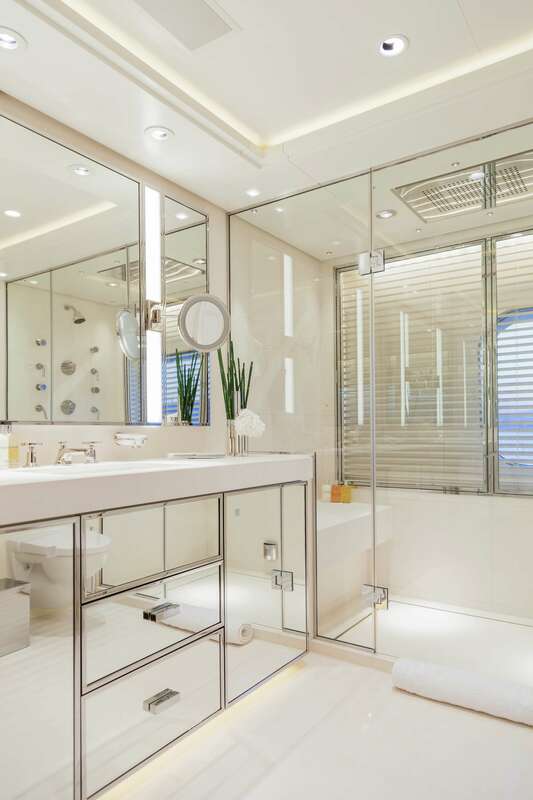 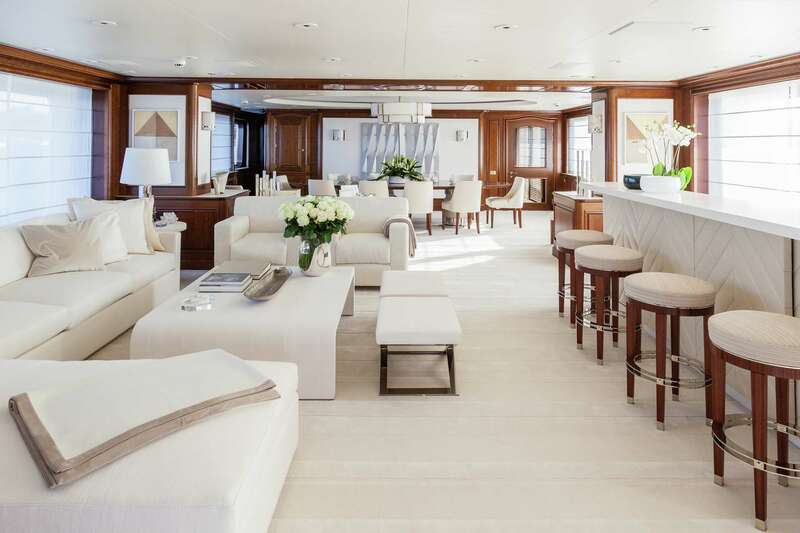 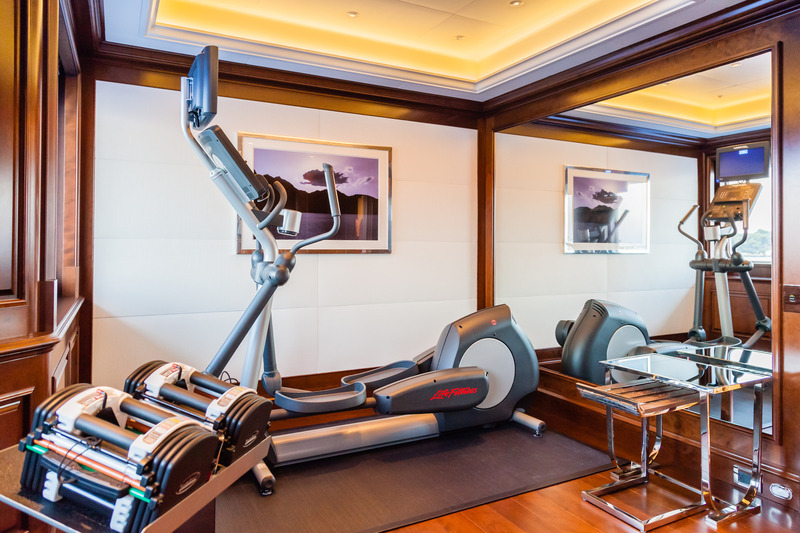 The lower deck contains a toy storage area and the majority of the guest accommodation, which consists of four VIP staterooms and two double cabins. 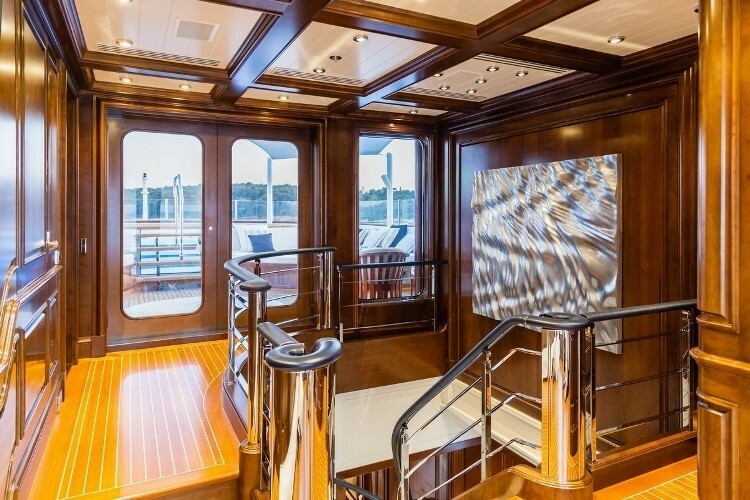 Amidships is the engine room and farther forward is the crew accommodation. 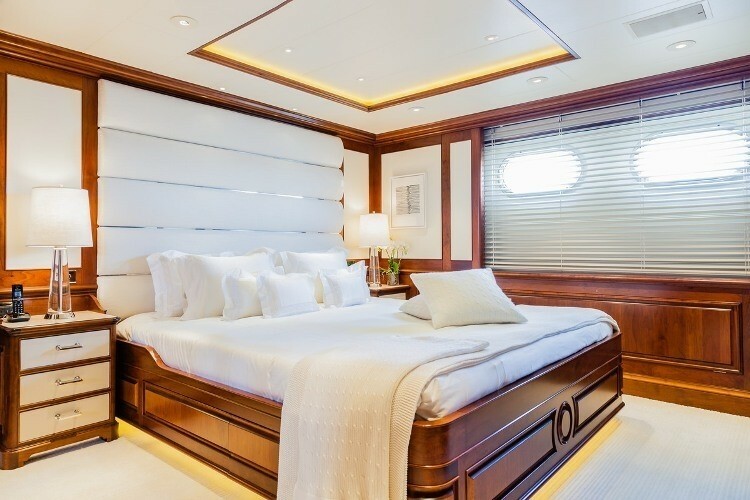 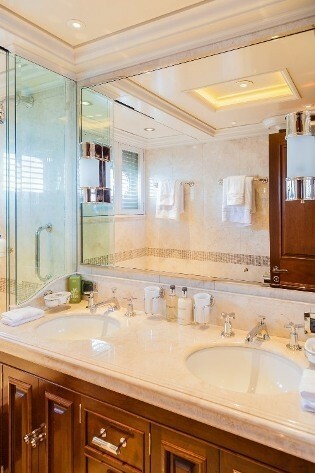 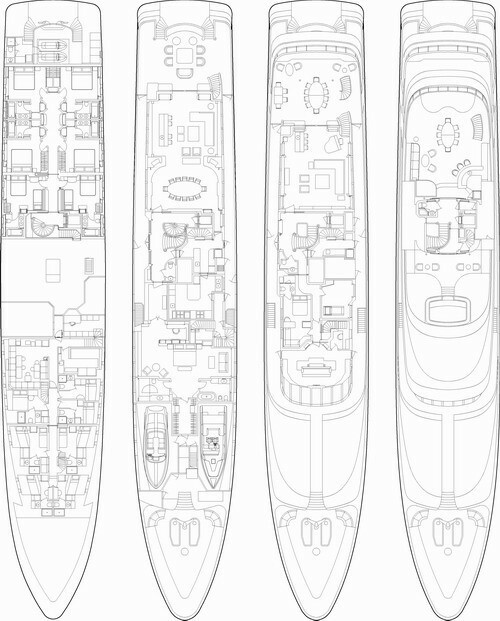 The main deck layout stores the tenders forward of the Master suite and they are launched and retrieved by side hatches. 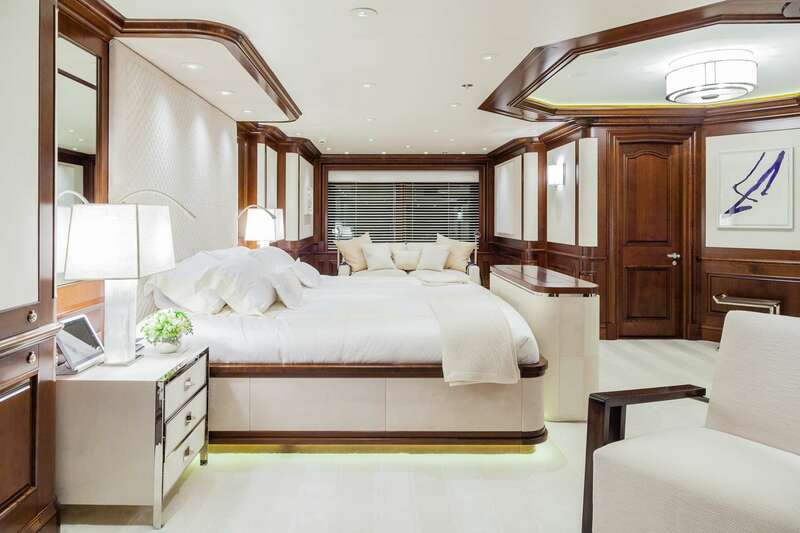 The full-beam Master suite has two separate 'his' and 'hers' bathrooms and a large walk-in wardrobe in between. 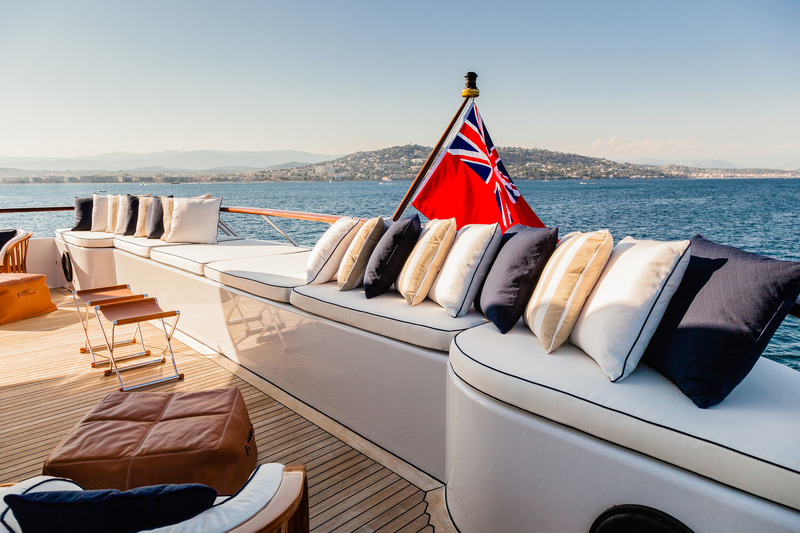 The seating is placed by the port and starboards windows and there is a forward office to complete the private facilities. 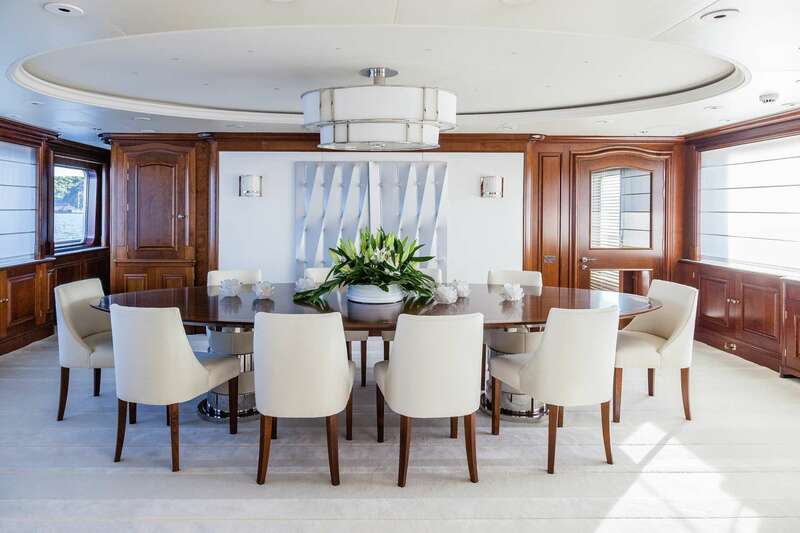 In the main foyer, a lift/elevator connects all the decks for quick and easy access for all guests, and behind, the formal forward dining area seats up to 12 guests at an understated oval table. 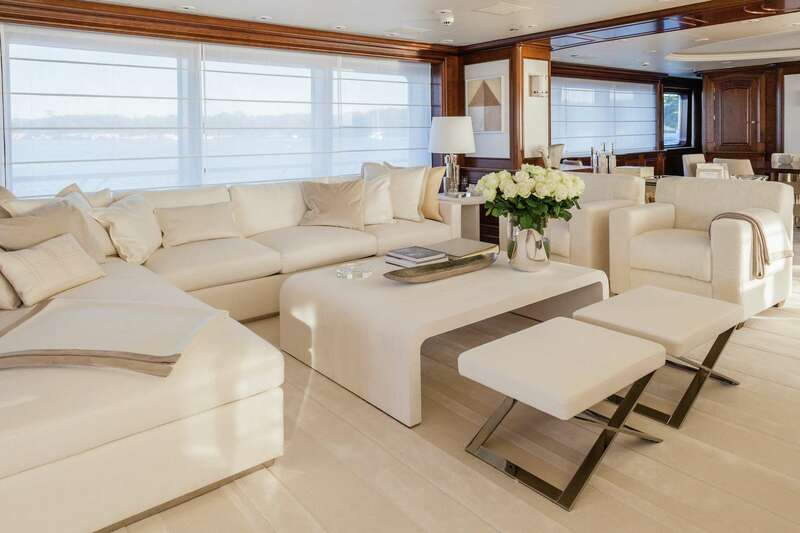 Natural light floods the interior through the large windows, and two sofas form an L-shape on the port side to take advantage. 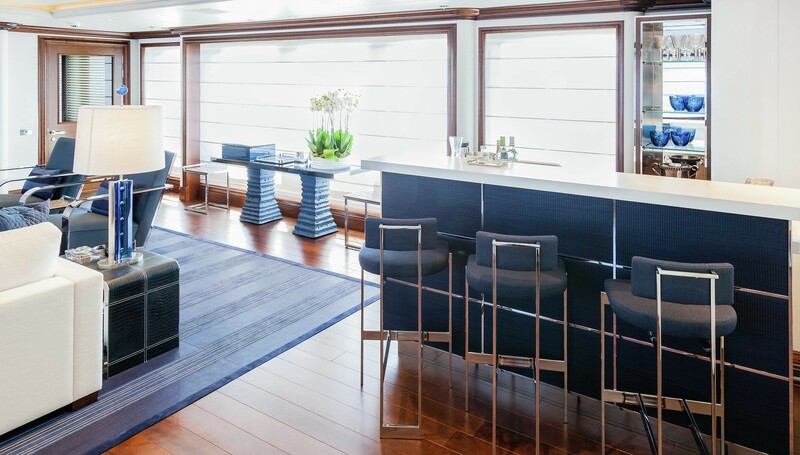 A pair of stools and armchairs, as well as a large coffee table, completes the lounge area and the bar opposite has an excellent variety of refreshments to suit any meal or social occasion. 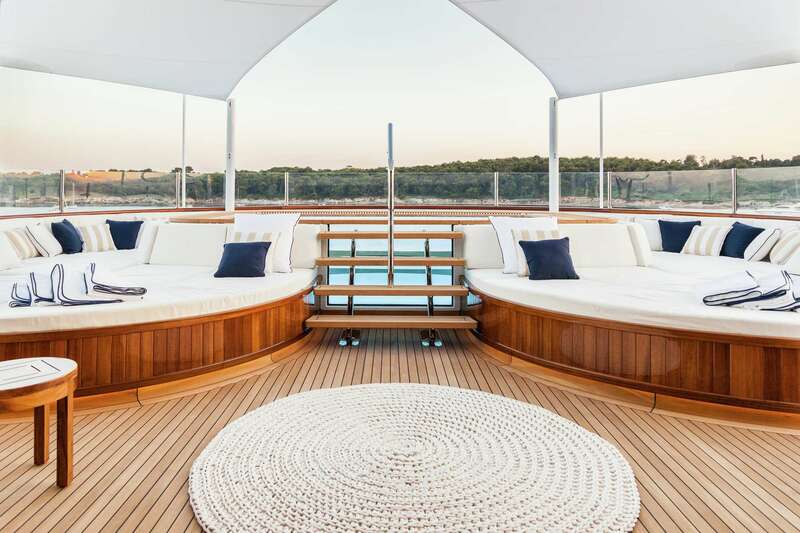 The upper deck has a blue-toned sky lounge with an L-shaped sofa, armchairs and a coffee table as well as a bar close to the aft sliding doors. 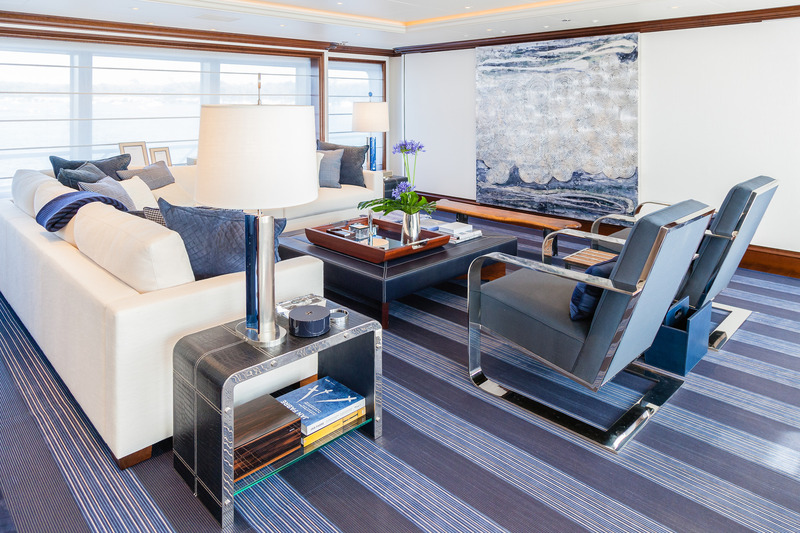 A smaller seating area takes advantage of the full-height windows for views over games and coffee. 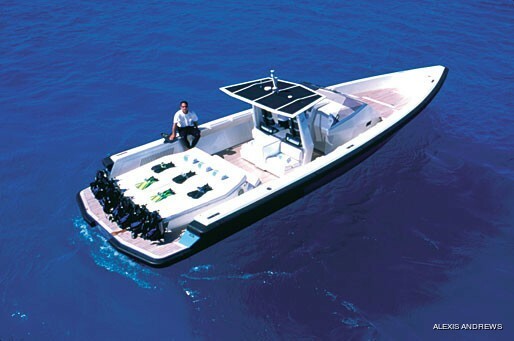 Two 2000hp Caterpillar engines produce a cruising speed of 12 knots and a top speed of 16 knots. 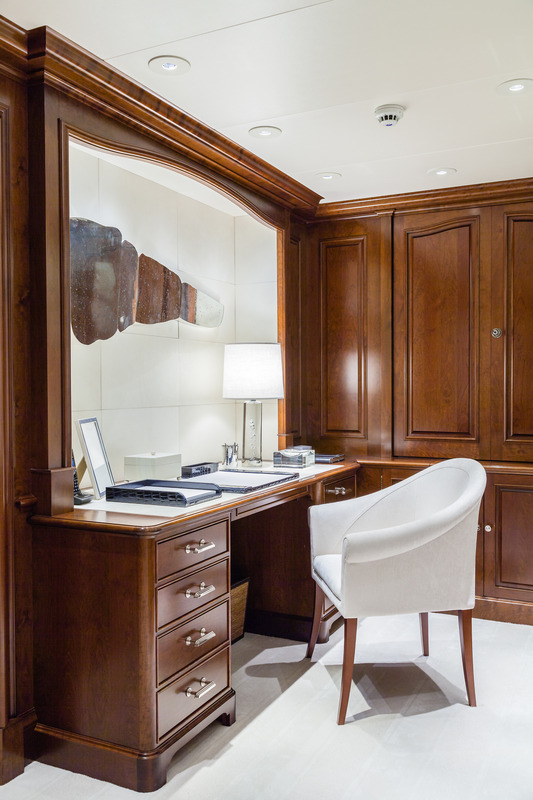 The accommodation sleeps up to 12 guests over 7 cabins: 1 Master suite, 4 VIP staterooms and 2 double cabins each with a Pullman berth. 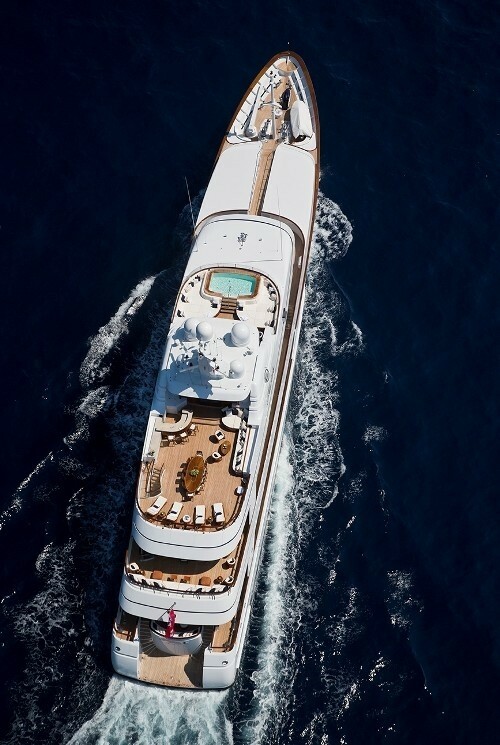 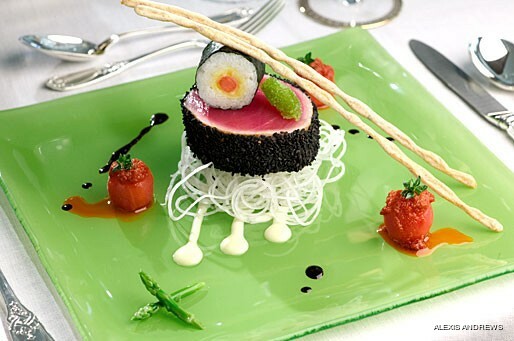 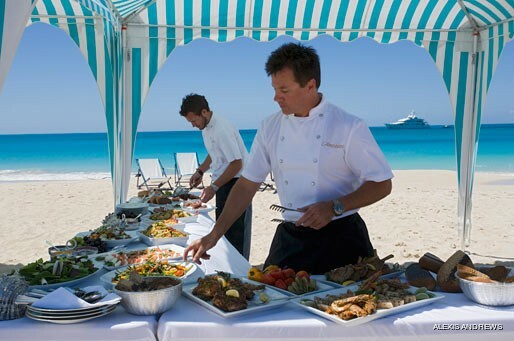 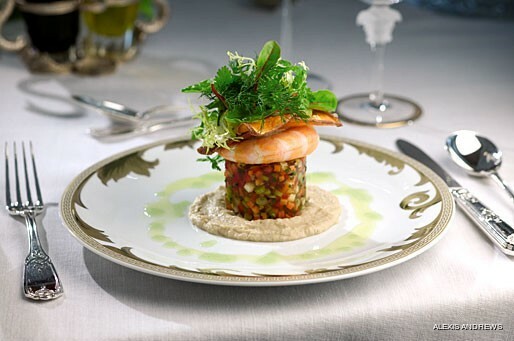 The crew of 17 will ensure that all guests and visitors on board receive the first-class service.